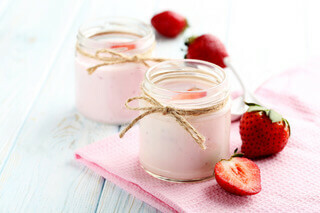 Yogurt has been transformed from a product only found in health food shops, to a mass market phenomenon, triggering a functional food revolution and becoming a multi-billion pound industry. Cultured milk products such as yogurt, are derived from pasteurised milk innoculated with bacteria, which convert part of the lactose into lactic acid, which coagulates the milk. The acids and aldehydes produced provide the typical taste and aroma, and also have a preservative effect on the milk.